Ansichten können aus dem Deck zu haben, oder besser laufen noch 1 Minute bis Waihi Beach und Baden im Pazifik. Sein ein ausgezeichneter sicheren Badestrand mit entspannten lokalen Atmosphäre. Carport Parkplatz, lokale Milchprodukte und Imbissbuden am Ende der Straße. Der Strand bietet eine große Auswahl an Cafés, Restaurants und dem berühmten Kneipe ein großartiger Ort, um ein Band zu fangen. This was a perfect bach for our family, perfect spot and the house was exactly what we wanted. The kids loved being able to watch the cars go by and walk to the beach. The location being 3min to the beach Wow.. We are definitely going to stay here again. The location is great - a short walk to the beach, corner shop and takeaway shop over the road. The location is great - a short walk to the beach, corner shop and takeaway shop over the road. About 3km from the township. We absolutely loved our stay at this bach. Well appointed bach, good selection of condiments and cooking equipment. Well appointed bach, good selection of condiments and cooking equipment. Amazing games collection, and heaps of great books to choose from. 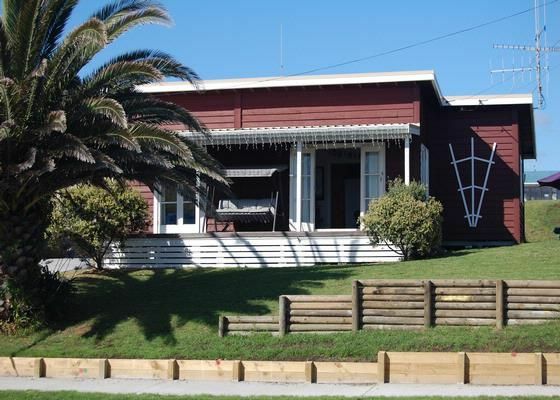 Nice and close to the beach, and has a well-stocked dairy and fish & chip shop across the road. Waihi Village is a bit far to walk for small kids, but a nice stroll otherwise. House was in an awesome location and we had a fantastic time. House was in an awesome location and we had a fantastic time. Would definitely stay again!